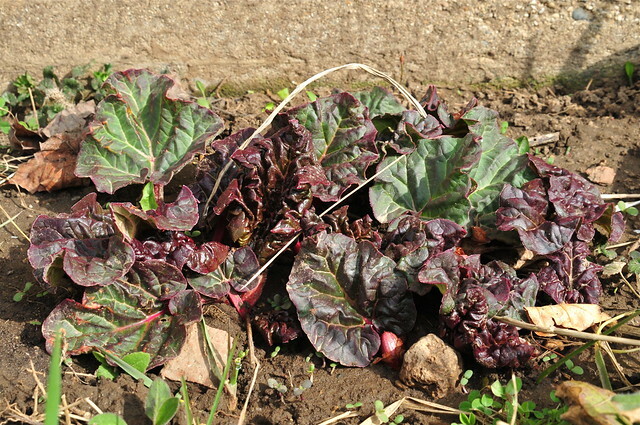 Seeing the rhubarb up, strong and motivated, is making my mouth water for rhubarb pie! Last year I think I made a dozen of them, keeping at it as long as I could find rhubarb. Along the way I discovered that my mother in law really liked it. To keep the ball rolling, I was given a couple of plants from her yard, and these are they (there is another plant next to this one). Here is the link to the simple pie recipe I used. • Preheat oven to 450 degrees F (230 degrees C). • Combine sugar and flour. Sprinkle 1/4 of it over pastry in pie plate. Heap rhubarb over this mixture. Sprinkle with remaining sugar and flour. Dot with small pieces of butter. Cover with top crust. • Place pie on lowest rack in oven. Bake for 15 minutes. Reduce oven temperature to 350 degrees F (175 degrees C), and continue baking for 40 to 45 minutes. Serve warm or cold. I used 8 T. of flour to make it gel more. I used 3 c. of rhubarb and 1 c. of strawberries. I used 1 c. sugar rather than 1-1/3 c (figuring I like the tartness of the rhubarb, and the strawberries would lend some sweetness). I made two open-face pies with my two crusts, so the recipe needs a slight tweak: Mix the remaining flour-sugar in with the fruit before dumping it into the crust. I did still put 1/4 of it on the crust before adding the fruit, and it did seem to keep the crust drier. Oh, and I skipped the butter as it didn't seem to be relevant. 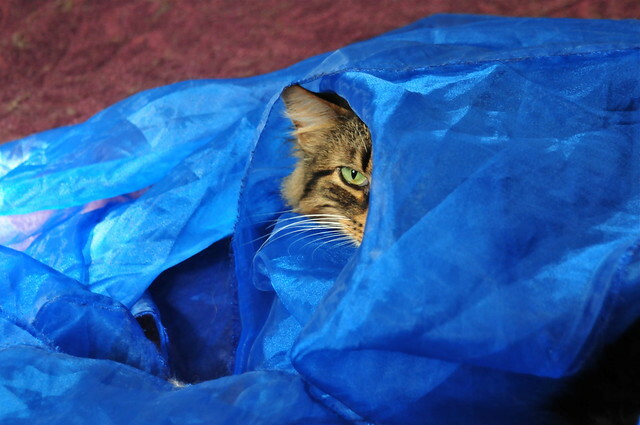 And for no reason at all, a gratuitous picture of our cat, Nala, who loves to burrow into this piece of fabric. It's pretty much hers now. Nala has a good artistic eye; that color is perfect with her coat! Every girl needs a piece of crystal organza to call her own! And that pie recipe sounds marvelous... I miss rhubarb pie.